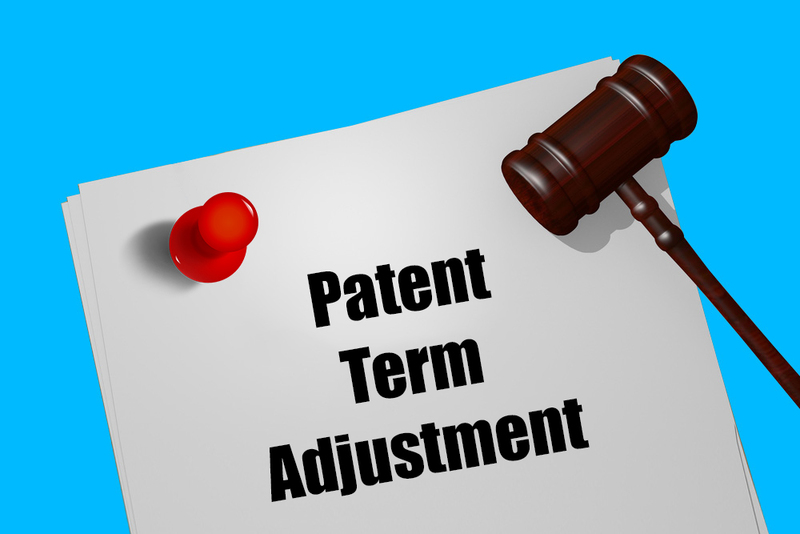 Patent Term Adjustment (hereinafter PTA) is not rocket-science and to enable you with the prowess to dive into the deep understanding of statutory requirements for the PTA without getting caught up with the trickiness of a legal draft, we provide a practical approach to explaining the fundamentals of PTA in a most simplified and easy-to-understand methodology. Before we begin let’s understand what is meant by PTA and how it is different from PTE (Patent Term Extension or Hatch-Waxman Act, 1984). 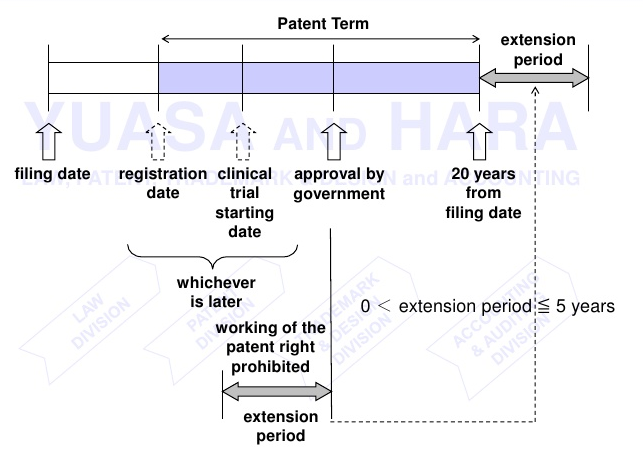 PTA is a law that accommodates for delays caused by the US patent office (USPTO) during the prosecution of a patent application in addition to the term of the patent. 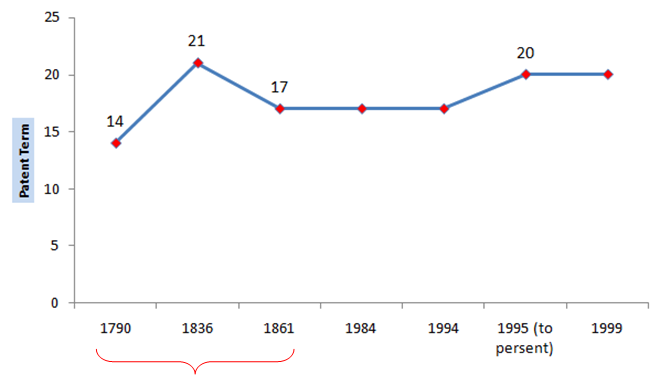 After the Uruguay Round Agreement Act (1994) and in order to achieve patent harmonization, the term of the patent was modified from 17 years from date of grant/issuance to 20 years from date of filing of the national patent application, with effect from June 8, 1995, thereby including the prosecution time within the ambit of patent term. This placed the onus on the PTO to conclude patent prosecution within 3 years from the filing date of application failing which would decrease the actual term expectancy of the patent and exclusive monopoly exercised therewith. Though there were provisions to account for “certain” delays like the delays caused by secrecy order, interference or appellate review, the real cornerstone for PTA as a measure to pass-on the benefit of untimely concluded prosecution to the applicant was set in the year 1999 with effect from May 29, 2000. On the other hand, PTE (Patent Term Extension) or Hatch-Waxman Act, 1984 was in effect well before the advent of PTA. 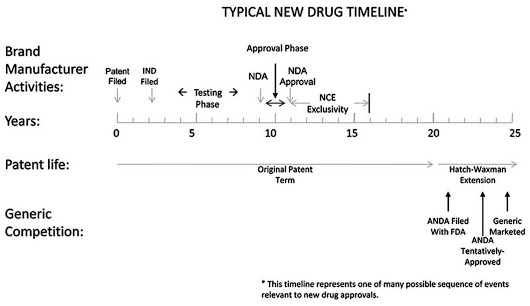 Also known as “The Drug Price Competition and Patent Term Restoration Act”, this was enacted to make up for the time lost out of the total patent term during the marketing approval process, especially to cater the patents in the field of drug and food industry where pre-market approval (for instance by FDA) is a must. This was also done to strike a balance between the interests of branded drug manufacturers and generic drug manufacturers. So, where PTE accounts for commercialization delays due to regulatory review, PTA caters to delays caused during patent prosecution. Both of them can be applied to a patent and it is under the jurisdiction of the patent office (USPTO) to award it. This accounts for delay caused by the PTO (Examiner and Issuing office) during patent prosecution. This is easily remembered as 14 – 4 – 4 – 4 (fourteen triple four) rule which includes — 1st Office Action should take place within 14 months of the application filing date; PTO (Examiner) should respond within 4 months of the Applicant’s response date; when on Appeal the PTO (Examiner) should respond within 4 months of the filing of Applicant’s reply brief; and the PTO (Issuing Office) should issue the patent within 4 months of the payment of Issue fees, failing which there will be delay accrued for every day after the mentioned dates. This takes care of the accountability of PTO to conclude patent prosecution within 3 years of filing, failing which there will be a delay accrued for every day beyond the stipulated period. However, there are certain “exceptions” to B-delay and time consumed for these exceptions during the prosecution stage are not considered when calculating B-delay. For instance, Request for Continued Examination (RCE), interference, derivation proceeding, secrecy order and review by Patent Trial and Appeal Board (PTAB) or court are considered as exceptions to B-delay. This is the post-Novartis way of calculating B-delay with exceptions where, unlike pre-Novartis, even if there are B-delay exceptions, time taken after Notice of allowance (NOA) till the patent is issued will still be considered as B-delay extension provided it has crossed the 3-year duration. One thing to note here is the filing of RCE is considered as an applicant’s delay and not an exception to B-delay if it is filed after Notice of Allowance (NOA). This accounts for B-exception delays, for instance delays caused by interference or derivative proceedings, secrecy order and patent appeal at PTAB, provided the outcome of such are in the favor of the applicant. It simply fills the gap created by the B-exception delays only when the appeal, for instance, is successful, where an appeal can be considered successful when at least rejection on one claim is reverted in the favor of the applicant. (Time taken by RCE is not considered here). Thus, such time consumed during the prosecution stage may still be added to PTA depending on its outcome. If PTA is awarded for the delay for which the PTO is accountable, it is also expected from the applicant to cooperate for a timely conclusion of the patent prosecution stage otherwise delay is accrued when the applicant fails to engage in reasonable efforts to conclude prosecution. 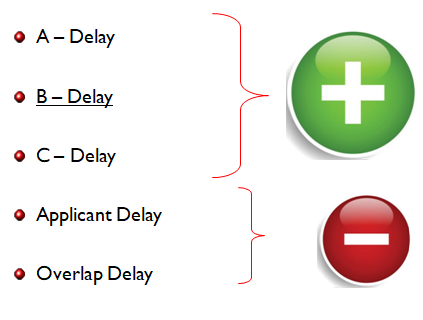 Applicant delay can be accrued through various factors. The most common type is when the applicant fails to respond to the Office Action within 3 months. Also, there are certain office actions where the time to reply is less than 3 months (for instance Requirements within shortened statutory period (SSP)). For a few such cases, applicant has an additional one month extension from the SSP for which delay is not considered. The maximum extension an applicant can get, to reply to Office Action is 6 months (5 months for SSP) with required fees, but beyond this period the application is deemed to be abandoned. One thing to note is filing of Information Disclosure Statement (IDS) one month before the Office Action can tantamount to an applicant’s delay, with certain exceptions (37 C.F.R 1.704 (d) 1.97 & 1.98) in which case the applicant received the “information” during prosecution of office action in foreign patent office and submits the same to the national patent office within 30 days from the receiving date. However, there are certain documents for which an applicant’s delay is not considered, for instance Power of Attorney, change of address, change of entity status, inventor’s oath or declaration, to name a few. But in any circumstance where the applicant’s delay exceeds the total of positive delays (A + B + C), the PTA can never be negative, i.e. the term of the patent will remain the same as provided by the statutory and no reduction in such cases will take place. The PTA calculation is always positive (PTA>=0). If there is any overlap of two or more similar delays (i.e. two or more positive-type delays, A or B or C), then the benefit of only one will be provided implying that one will not get double benefit from the same duration for which delay is accrued. In the case, as illustrated above, the duration between D-E is considered twice, once as a part of A-delay and again as being a part of B-delay. Hence, the total calculation will remove the overlap Td-e. However, there is an interesting case (Wyeth v. Kappos, No. 2009-1120 – January 07, 2010) where the term “overlap” is given a new meaning. PTA data and calculations performed by PTO can be accessed through Public PAIR and is also mentioned in the Issue Notification document. In case of any discrepancies in PTA calculation, the applicant can approach the patent office within 2 months (extendable to 5 months) of the issuance of the patent, and if still not satisfied can also file a civil action in district court within 180 days. Patent term gives a patent owner an exclusive monopoly during that period and it is of the utmost importance to pay attention to the calculation of the patent term to exercise such rights. Besides, there are various strategies to utilize which can enhance the patent term. 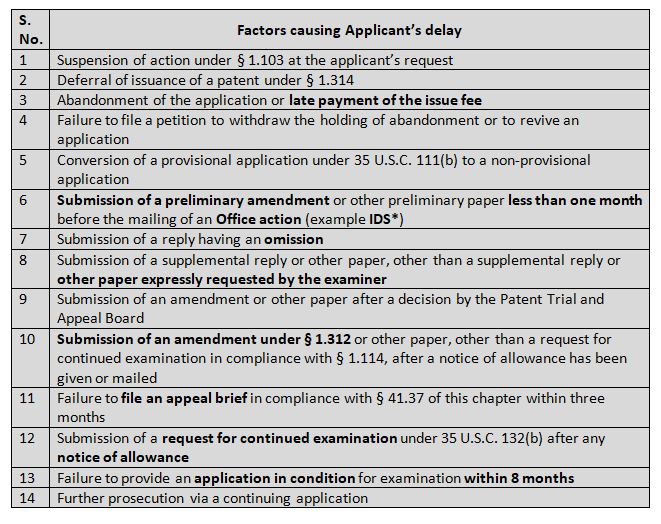 Using restrict/elect requirements followed by filing a divisional application instead of filing a terminal disclaimer to overcome double-patenting rejection; appealing instead of filing a RCE if one is sure of the outcome coming in one’s favor; avoiding filing a RCE before 3-year pendency period; and avoiding applicant’s delay are a few ways that may help in extending patent term.